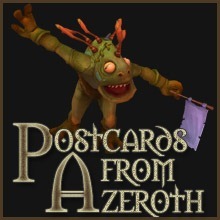 TNB is happy to welcome Rioriel of Postcards From Azeroth to the show this week. Another European guest, he’ll be staying up until the ‘wee’ hours of the morning to hang out. If you have any questions for him, please send them in or call our voicemail and we’ll make sure we get the answers! Also, don’t forget to join us in the live chat room! When is it? : This live show is scheduled for Saturday, January 15th at 8pm PT (11pm ET). Not sure what time that is for you? Use this handy-dandy time converter! Awesome choice for a guest. Ask him about his process for creating the images. The colors and the lighting really pop and are really vibrant. I love those postcards. I can’t wait to tune in! im so sorry i missed your live show rioriel 🙁 i was in an unavoidable officer meeeting. Im sure it was a blast! I fell asleep at 3:30!! Going to listen to it as soon as it it’s up!